Bored with the same old Spaghetti and Meatballs or Macaroni and Cheese as pasta options for dinner? 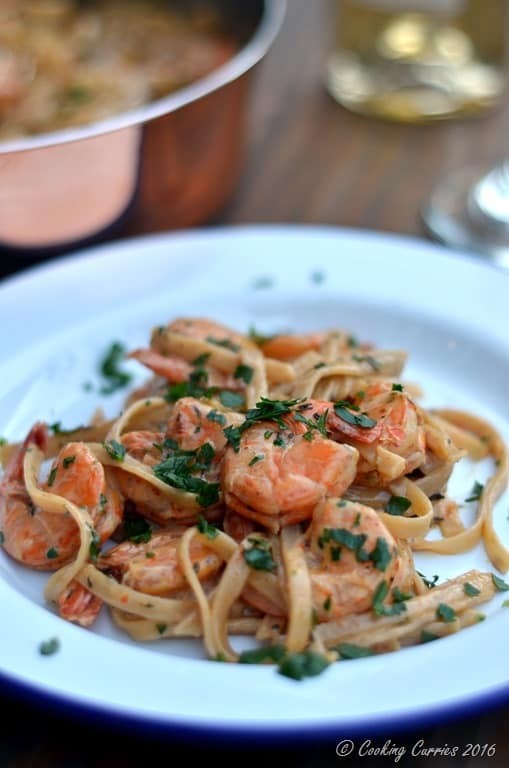 Here is a creamy yet light Cajun Shrimp Fettuccine with a refreshingly spicy taste, that will make your weeknight dinner easy and not so boring! The meat-a-holic here loves his seafood. But he only loves it nice and spicy. 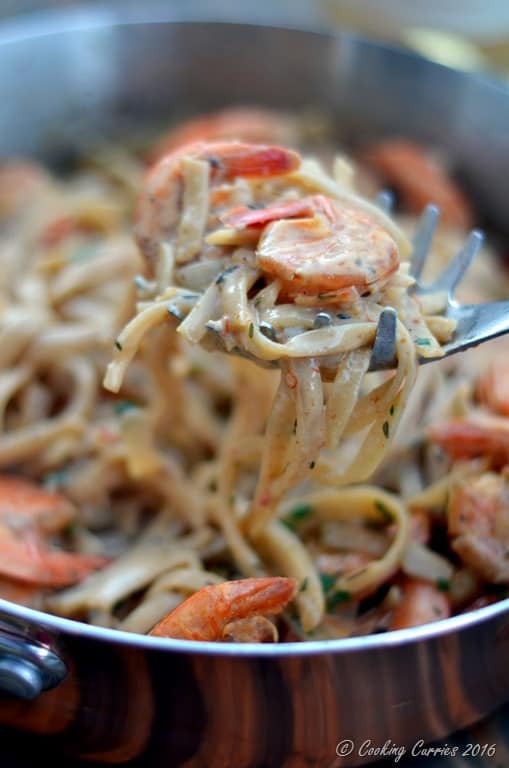 I have always wanted to twist and turn up the regular pasta contender we have and make something with seafood in it. I first thought of something garlicky with scallops in it. Then I remembered having some shrimp at hand and to make it spicy, I decided to go the Cajun way. It has cream in it but no cheese and the cream sort of brings all the elements together in taste and also very literally. 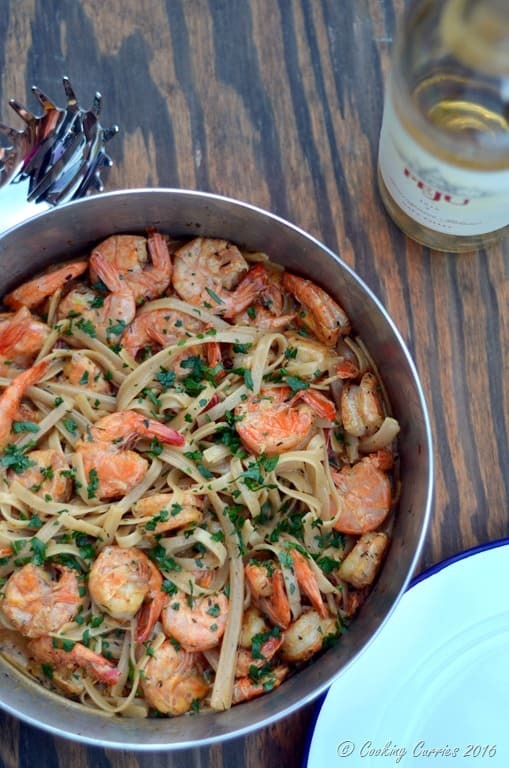 The pasta I have used here is Brown Rice Fettuccine and I did not make any roux for the cream base, so this pasta is technically gluten free too! Normally, I would’ve just put some of the Cajun Seasoning that I get from World Market and call it a day, because that seasoning mix is just that good. But I did not have enough of it, so I had to add my own garlic powder, paprika, cayenne, black pepper, oregano and red chilli flakes to it as well. I kinda freaked out a little when I found out that I did not have enough of the seasoning mix. I know I have all the ingredients individually. I mean, c’mon, have you seen my spice drawer?!? Just the thought of losing the flow of how I was getting my cooking going, unnerved me just a little bit. I will have to confess to that much. But it all turned out fantastic. All is well, that ends well, right?! It was a particularly hot day and when I thought of a wine I wanted to take out for dinner that night, the 2010 Sauvignon Blanc that we had gotten from Peju winery from our visit to Napa Valley a few years back, came to my mind. 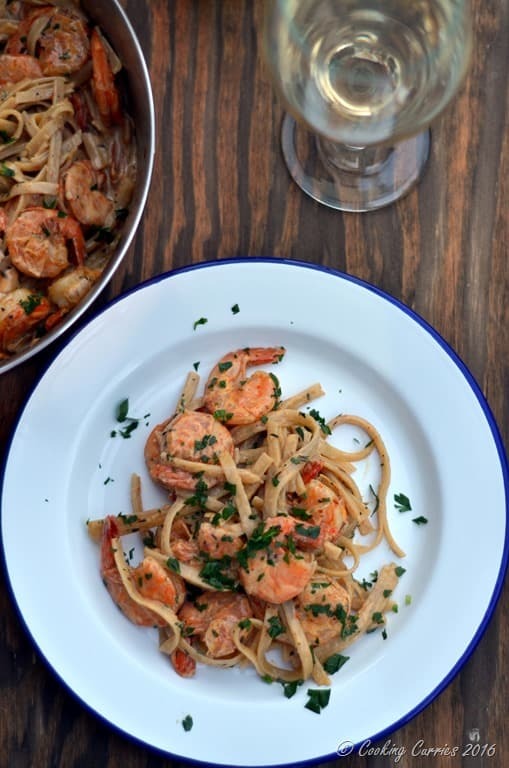 The Sauvignon Blanc has a very distinct fruity flavor – especially tropical fruits and a crisp finish to it and I thought it would go very well with the shrimp and the light yet spicy sauce. And it did. 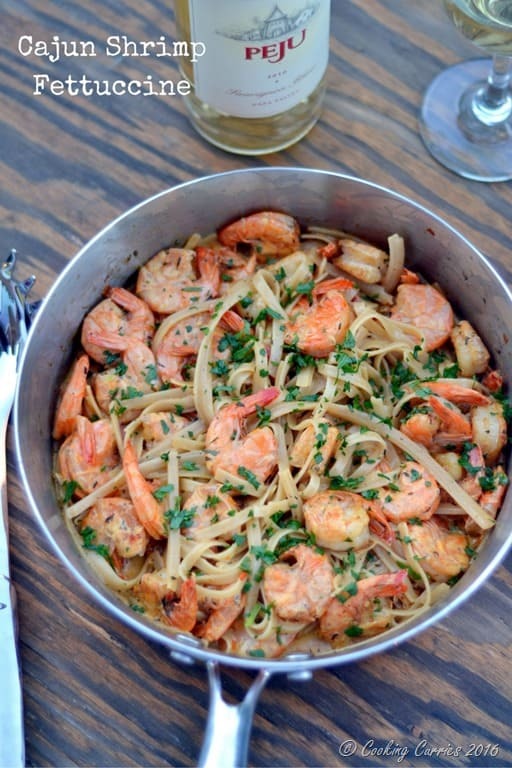 I had the same version of pasta, minus the shrimp and some roasted veggies added to it. The 2010 Sauvignon Blanc was wonderfully delightful to pair with this. We just recently visited the Napa Valley and shipped back wines from Peju and Castello di Amorosa. I cannot wait to pop open those bottles and pour me some Napa goodness soon! Cook the pasta in salted boiling water, till al dente. Remember brown rice pasta takes a tad bit more than your regular pasta to cook. Meanwhile, in a sauté pan, heat the olive oil over medium high heat. Add the garlic and give it a quick stir. Add the shrimp and all the seasonings and spices. Add some salt as well. Sauté till the shrimp is cooked and turns pink. Take the shrimp out to a plate. Add the cream and milk to the pan and let it mix in with the leftover spices in the pan and deglaze it a little. Make sure you keep the heat low-medium. The pasta should be done by now. Drain the pasta water out and rinse the pasta a little with cold water. Add the pasta to the cream mixture. Add the shrimp. Check for salt. Mix well and let it cook together over medium-high heat for just a couple of minutes. Remove from heat, garnish with minced parsley and serve immediately. I like my seafood spicy too! This sounds great! That looks like something I should get to know better! Love the pictures, love the recipe. Me & shrimp go waaaaay back….
? thanks ! Now you can give the brown rice pasta another try!